Weddings. They’re either the most beautiful moment of a couple’s life or a fervent obsession representing the end-all-be-all of a woman’s happiness. That’s the cliché, anyway, one 27 Dresses is happy to support. Having also produced the similarly themed The Wedding Planner, director Anne Fletcher imbibes her movie with a vulgar amount of rom-com formula and wedding zaniness. The plot surrounds Jane (Katherine Heigl), who is always a bridesmaid but never a bride, literally. Be it cake, location, flowers—Jane is the go-to gal of wedding planning. She loves what she does, perhaps too much: she fanatically cuts out articles from her favorite Weddings column written by what she assumes to be a dreamy male journalist; her numerous bridesmaid dresses are kept in her closet like a shrine, and her own wedding is already planned down to the last detail. If only she wasn’t single. When the movie begins, Jane juggles bridesmaid duties for two weddings. Nevermind that she must be friends with both brides, who must, in some form, know of each other, thus would avoid planning their weddings on the same night. It makes for bland, chuckle-worthy physical comedy to have Heigl running out of one reception, into a cab where she changes, driving across New York City, into the second reception, back into the cab where she changes again, in and out, back and forth, all night long. Please don’t look for logic. It’s a romantic comedy. Heigl struck gold with last year’s Knocked Up, which she later spurned to Vanity Fair magazine, saying “It’s a little sexist. It paints the women as shrews, as humorless and uptight and it paints the men as lovable, goofy, fun-loving guys. It was hard for me to love the movie.” Heigl, who recalls some Parmigianino-Mannerist figure with her elongated features and pastel air, doesn’t place herself in a masterpiece of feminist filmmaking here. 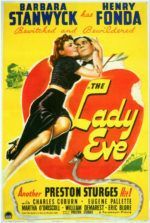 Women are painted as marriage-obsessed and man-hungry, falling into a number of romantic-comedy traps normally reserved one-per-film. Ever-building is the film’s meet-cute device, a filmic apparatus where two people who hate each other end up in love. I’m referring specifically to Jane and Kevin. One hilarious scene finds them stranded in a backwoods bar, drinking shots and unintelligibly singing the already incomprehensible lyrics to “Benny and the Jets”. 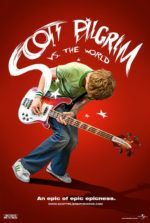 Their onscreen charisma is immediate and believable, whereas Burns flies this one on autopilot, and Akerman manages to be only slightly less annoying than she was in last year’s The Heartbreak Kid. 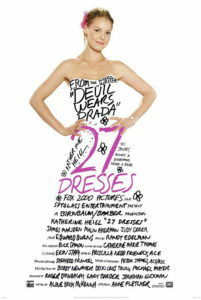 27 Dresses is jealously made for wedding-obsessed women, ostracizing everyone else in the theater. If you’re not married, you’re stricken with enough subliminal brainwashing that after viewing you must find a spouse. Audiences are made to feel ashamed for being unmarried. I feel sorry for any first-daters attending this movie, as unsuspecting men will suddenly see a much-too-soon glint in their sweetheart’s eyes. Beware. If inconvenienced by the WGA strike, you can catch your favorite television stars in theaters over the next few months. Grey’s Anatomy star Patrick Dempsey can be seen in Enchanted right now and Made of Honor due later this year. Lost’s Matthew Fox has Vantage Point due in February and Speed Racer due in May. And while Heigl, also of Grey’s Anatomy fame, attempts to enter herself as a pseudo-Meg Ryan figurehead of romantic-comedy, she only just gets the job done. I can see Heigl making a name for herself in the genre, but with material not so remarkably mediocre and familiar. Despite that familiarity, I laughed when I was supposed to and was occasionally caught up in the romance. But I’m a romantic, occasionally willing to tolerate a thick slice of cheese for a happy ending.